mdxipe – Page 2 – We are the students of international political economy at Middlesex University Department of Law and Politics. We are the students of international political economy at Middlesex University Department of Law and Politics. What is the most urgent issue in the global political economy today? As a Londoner born and raised, specifically a white male Londoner, I have never experienced any racial bias based on my personal appearance or religious identity. Growing up in an ethnically and religious diverse society has given me a unique experience and being a part of a multicultural society has forced me to address the differences and analyse potential inequalities other people may face. To assume the issues of race and social inequality is less than it was 50 years ago is subjective to the individual but issues in every society that in some form is built from traditional systems that were at one time very unequal. The global political economy still functions in this way, to an extent, and to really develop progressively is to dismantle the systematic belief systems that keep specific members of society marginalised. The global political economy requires social cultivation alongside the process globalisation; the interconnected trading and deals modern countries need to adhere to, to be sustainable. This causes issues when domestic inequality occurs when the focus is on expansion. The factor of ethics and governments being irresponsible within their own society’s link to the issue of race inequality and the social disadvantages certain demographics experience. Systematically rooted into the American society, gun control is constantly fought for due to the constant loss of life. The abuse of gun crime and police brutality has led to a spotlight on the American police system. The issue of police brutality isn’t simply confined to Black vs White, but is an example of the inequality and privileges people face in America on the basis of their skin colour. The stereotypes linked to race and religion, applies a living disparity to certain people; which fuels the trigger happy police officers as they expect a criminal when it’s a normal law abiding citizen living their life. In the UK, there is rooted racial inequality in the school system. Specifically focusing on school exclusions, follows the experience of the Traveller community. Compared to other racial groups in the UK, the figures aren’t so inflated; ‘Last year almost one in five schoolchildren from Gypsy or Irish Traveller backgrounds were suspended from school and about one in 250 were expelled’ (Gayle, D. and Marsh, S., 2018). Inequality usually is developed in various factors in society, the Traveller community being one of the least affluent and excluded demographics in the UK. Racial inequality is impacting their education and furthermore limiting them in future job opportunities compared to other British communities. The issue of racial inequality is significant to the politics of Theresa May. The prime minister has acknowledged that there is an unjust barrier in the British socio-economic system that negatively impacts minority groups across the UK. The measures brought up primarily focus on workplace inequality and the disparity of wealth and income when comparing the different racial groups across the UK (GOV.UK, 2018). Using this link you can search a plethora of data recordings about the British workplace statistics categorised by racial grouping; examples are unemployment rates, work sector analytics and average incomes. The aspect of political reaction to the issues of inequality in its many forms has sparked interest from many aspects of society; from the public, the elite and intergovernmental control. However, this also begins to discuss the inequalities within societies when it comes to addressing culture and factors of culture that are important to the framework of political decisions and a normative society. Religion is a key factor of culture, creates a specific community in a country and can even be an influencing aspect to the political belief system. In China we are experiencing a saddening event, ‘one million Uyghurs who are locked in internment camps in China because they are Muslims’ (Cook, M., 2018), this is due to the Chinese authorities wanting to push atheism to be in support of the Chinese socialist regime. This is an issue to the global economy as it infringes the ethics and safety of its people due to the strong forceful nature of the Chinese society in what it wants of its people and how their system is organised around the lack of religious identity. The encouragement of religious freedom is crucial to solve societal inequality and can furthermore boost the change of systematic values in a number of counties, maybe even China due to their very outwards looking approach to global trade. The aspect of economics being a pivotal aspect to political change in very traditionalist countries may be the pushing factor in achieving this change. Furthermore, the support of the Pope as he is an advocate of religious freedom and religious identity will hopefully have a positive effect in solving religious inequality; that can be linked into racial inequality in society dye to the broad groupings and demographics people are marginalised into. The Pope’s message refers to the assumption that religious inequality is deemed only an issue to a designated minority, in EU court rulings, which is inefficient in solving the issue of religious inequality as it doesn’t reflect it as a human right, but as a social circumstance or a social consequence of being a part of a specific religion or religious community. This reflects the need to ensure inequality is deemed a human right, rather than a disadvantage in society as it interconnects everybody. Gender, economic background, race and religion are unique to everyone and in society they shouldn’t be seen as distinctive differences to the extent at which certain people benefit from the day they are born. Bordoni, L. (2018). EU Bishops: religious freedom is a human right – Vatican News. [online] Vaticannews.va. Available at: https://www.vaticannews.va/en/church/news/2018-12/comece-european-union-human-rights-religious-freedom.html [Accessed 14 Dec. 2018]. Cook, M. (2018). MercatorNet: Why isn’t religious freedom ‘the defining issue of our time’?. [online] MercatorNet. Available at: https://www.mercatornet.com/above/view/why-isnt-religious-freedom-the-defining-issue-of-our-time/21972 [Accessed 14 Dec. 2018]. Gayle, D. and Marsh, S. (2018). From football to dating to TV: 10 areas rife with racial bias in UK. [online] the Guardian. Available at: https://www.theguardian.com/uk-news/2018/dec/03/from-football-to-dating-to-tv-10-areas-rife-with-racial-bias-in-uk [Accessed 14 Dec. 2018]. GOV.UK. (2018). PM launches series of measures to tackle barriers facing ethnic minorities in the workplace. [online] Available at: https://www.gov.uk/government/news/pm-launches-series-of-measures-to-tackle-barriers-facing-ethnic-minorities-in-the-workplace [Accessed 14 Dec. 2018]. Lopez, G. (2018). There are huge racial disparities in how US police use force. [online] Vox. Available at: https://www.vox.com/identities/2016/8/13/17938186/police-shootings-killings-racism-racial-disparities [Accessed 14 Dec. 2018]. Student Debt: Is it really any good? Students in higher education already have it hard enough; tough workloads, sleepless nights, constant scouting for unpaid internships,not to mention extremely competitive graduate jobs and having to fork out hundreds for the graduation ceremony. Graduating with £50,800 student debt on average is just the icing on the cake (Coughlan, 2017) Student Loans may appear as a blessing, enabling millions of students that wouldn’t otherwise be able to, to obtain a degree without paying anything upfront. However the debt creeps up on many students and can even contribute to psychological problems such as stress and depression.Is student debt fair, and more importantly does it actually benefit the economy, or increase the national deficit further? Approximately£16 billion is loaned to around one million students in England every year (Parliament.UK,2018). The amount of outstanding loans as of March 2018 is £105 billion, but is predicted to be around £450 billion by 2050. The Government expects that 30% of current students will repay their full loan. From an economical point of view, student debt can be positive by generating an influx of money into the economy through interest on the loans paid back. Loans are being sold off by the government to firms and companies, in order to benefit from sudden money injections. However,on the flip side student debt can have negative effects on the economy. The reality is most graduates will never fully repay their loans; only 30% of loans are foretasted to be repaid, resulting in a significant potential loss to the government. Students that have started loan repayments have less disposable income, resulting in less consumption from the future workforce. The government themselves are not blind to the negatives; student loans have been criticised by parliament for“not covering living costs,excluding part-time students, being too expensive, targeting its interest rate subsidy at higher earning graduates and putting off those who are concerned about graduating with large debts.” (Parliament.UK, 2018). This is not the only issue; the Independent states that “The Government failed to get the best deal for taxpayers when they sold off student loans for less than half their £3.5bn face value”, according to MPs, due to taking a ““short-sighted” approach to the sale of public assets inits effort to reduce government debt.” This demonstrates how in the long run,relying on student debt to feed into the economy is not the most reliable option. The financial effects are not the only issue that student loans encompass. There is also the question of fairness; why must some students pay significantly more than others, purely depending on the year they are born in? There has been an immense increase in the amount universities charge yearly. Until 1998, university was free for students and provided for by the tax payer. Tuition fees started at £1000, raising to a maximum of £3000 in 2004 (Wiki, 2018). It gradually raised in relation to predicted RPIX inflation for the following year. The monumental decision to raise it to £9000 for 2012/2013 students was met with much protest, yet it has increased again to £9250. The interest rate applied when repaying also rises. Nikki Morgan, chair of Commons Treasury Committee states that the RPI index used for interest “appears grossly unfair”. The RPI generally gives a higher rate of inflation than the consumer price index (CPI), resulting in students repaying more than they would under CPI, which is used for high street loans. Ms Morgan also pointed out how the government usually uses the lower measure for “formulae affecting money it has to pay out such as pensions and benefits, but the higher one for money people have to pay in such as student loans.” (The Independent, 2018). In 2011, Mr Bunga-Bunga, Silvio Berlusconi, resigned as Prime Minister of Italy, effectively ending his 17 year-long dominance of the political right in that nation. This was not a normal resignation; the Italian economy was in recession and had entered into an acute debt crisis. This coupled with Berlusconi’s, er, ‘night-time activities’ destroyed his political credibility. He had just lost a majority in the Chamber of Deputies and his final day was met with protests and insults. He would be replaced by Mario Monti, a prominent Italian economist in what was not a usual Prime Ministerial change, but a forced appointment driven by the central powers of the Eurozone. Only one party would vote against it in the Chamber of Deputies, a small regionalist party named Lega Nord (Northern League) (McDonnell, 2012). The result was a complete mess. Italian GDP contracted, falling from almost $2.4 trillion in 2011 to $1.8 trillion in 2015 (The World Bank, 2018a), while the unemployment rate went from 8.4% to over 12% in 2015 (The World Bank, 2018b). Its debt-to-GDP ratio is now even worse, with the Italian state debt raising from 118% in 2011 to 157% in 2015 (OECD, 2018) despite austerity packages designed to bring debt under control (Babbington, 2011) and while countries like Portugal, Spain and even Greece show some signs of emerging, Italy remains marred in economic crisis, it’s economy sluggish and unemployment stagnant. Now it is happening again, earlier this year there was the election of a populist government, this time a coalition of 2 populist parties, Movimento 5 Stelle, (5 Star Movement, M5S) and Lega Nord. Amidst the backdrop a global economic outlook that is increasingly pessimistic, Italy has been plunged into a new crisis. The first political crisis emerged when the new coalition’s chosen Minister for the Economy and Finances, Paolo Savona, was blocked by President Sergio Mattarella on the grounds that he was too Eurosceptic. This led to the preferred Prime Minister, Giuseppe Conte stopping his attempt to form a government. The following day the coalition backed down and agreed to a new finance minister, Giovani Tria. The crisis would be the beginning of a saga that would end up with the European Commission threatening to discipline a Eurozone state for the first time. In August, the crisis evolved when the Italian budget was condemned by the European Union, jolting the markets that seem to have little faith in the Italian Government. Something that shouldn’t be considered at all surprising considering the instability of the Italian political system. The crisis, however, is surprising in how long Italy has been at current debt levels. Italy’s debt ‘monster’ as it has become known didn’t emerge as a result of the 2008 recession, but rather from the 1980s when there was a substantial increase of government debt (Marro, 2018). The fact that is now being touted as a cause for major economic instability is cause for concern. The ‘monster’ debt levels plaguing Italy continued into the 1990s and were worsened with the creation of the European Monetary Union and the Euro. The EMU enabled Germany and the core Eurozone economies to become hyper-competitive against Italy and the periphery economies. This was in part to two things. Firstly, the German supply chain that expanded into the Czech Republic, Austria, Hungary and other Eastern European states, which Italy didn’t have. Secondly, the removal of exchange rate risk (because states had lost control of their currency) that resulted in huge capital inflows into the periphery states from the core states. In short, private finance in northern states began flooding into southern states who as a result of an abundance of credit saw consumption spike and house prices continually rise. (Guerrieri & Esposito, 2012). This fuelled consumption, enabling growth but failed in reducing debt ratios while also resulting in sky-high private debt levels in the periphery states. The result was seen in the aftermath of the 2008 economic recession which saw ballooning private sector debts bottom out, particularly in the housing market (Ravenhill, 2018), cratering economic growth in the periphery while also dragging in the core states by seeing exports curtailed. The fact that is now being touted as a cause for major economic instability is cause for concern simply because THIS ISN’T A NEW PROBLEM CAUSED BY A SUDDEN RISE IN DEBT. How on earth could the Italian state have been so enamoured with a devastating debt burden be considered not only stable but worthy of entrance into the Eurozone?! A currency union with supposedly strict rules and guidelines, led by experts, politicians and technocrats that should supposedly know better?! And how is it now only just being considered a crisis which only fiscal restraint and privatisation will solve despite it having existed way before the 2008 private debt crisis and global recession?! Babbington, D (2011) Italy parliament gives final approval to austerity plan, Reuters, Available at https://www.reuters.com/article/us-italy-austerity/italy-parliament-gives-final-approval-to-austerity-plan-idUSTRE78C7NF20110914. OECD (2018), General government debt. Available at: https://data.oecd.org/gga/general-government-debt.htm (Accessed on: 14th December 2018). Ravenhill, J (2018) Global Political Economy,Oxford, Oxford University Press 5th, Ch 1, pp. 4-12. The World Bank (2018a) Databank. Available at: https://data.worldbank.org/indicator/NY.GDP.MKTP.CD?locations=IT (Accessed: 14th December 2018). The World Bank (2018b) Databank. Available at: https://data.worldbank.org/indicator/SL.UEM.TOTL.ZS?locations=IT (Accessed: 14th December, 2018). Students in higher education already have it hard enough; tough workloads, sleepless nights, constant scouting for unpaid internships, not to mention extremely competitive graduate jobs and having to fork out hundreds for the graduation ceremony. Graduating with £50,800 student debt on average is just the icing on the cake (Coughlan, 2017). Student Loans may appear as a blessing, enabling millions of students that wouldn’t otherwise be able to, to obtain a degree without paying anything upfront. However the debt creeps up on many students and can even contribute to psychological problems such as stress and depression. Is student debt fair, and more importantly does it actually benefit the economy, or increase the national deficit further? Approximately £16 billion is loaned to around one million students in England every year (Parliament.UK, 2018). The amount of outstanding loans as of March 2018 is £105 billion, but is predicted to be around £450billion by 2050. The Government expects that 30% of current students will repay their full loan. However, on the flip side student debt can have negative effects on the economy. The reality is most graduates will never fully repay their loans; only 30% of loans are forecasted to be repaid, as represented in the graph above, resulting in a significant potential loss to the government. Students that have started loan repayments have less disposable income, resulting in less consumption from the future workforce. The government themselves are not blind to the negatives; student loans have been criticised by parliament for “not covering living costs, excluding part-time students, being too expensive, targeting its interest rate subsidy at higher earning graduates and putting off those who are concerned about graduating with large debts.” (Parliament.UK, 2018). This is not the only issue; the Independent states that “The Government failed to get the best deal for taxpayers when they sold off student loans for less than half their £3.5bn face value”, according to MPs, due to taking a ““short-sighted” approach to the sale of public assets in its effort to reduce government debt.” This demonstrates how in the long run, relying on student debt to feed into the economy is not the most reliable option. As I stated in the pervious blog I said that this subject will be continued in this second blog as the statistics of the subject were not properly explained. I will mainly focus on basketball as there is more information to show, this will present better arguments. This blog will show you multiple graphs in which they will show why women basketball is suffering and how that may effect the economy. The first table shows the different statistics of the male NBA (National Basketball Association) and the WNBA (Women’s National Basketball Association). The table above shows the difference between each league. As you can see the WNBA has their statistics much lower than the NBA one example is the Total points, which has a quite large difference of 25.74 points per game now that does not seem like a lot but when you take in account that those points are on average so even if a game from WNBA could end in a higher score it will probably will not go higher than the average of the NBA total points. Now this could be a reason why the WNBA is suffering economically as the entertainment is not as fun or as higher stake another can be that the highest scorer in the WNBA is only 53 points in a game whilst in the NBA it is 100 points. This in a way shows why people prefer the male side of basketball than the female one however not allowing women to prove themselves more and not getting paid the right amount of money could be the reason why there is not this focus for female athletes to push themselves in a more athletic game which could include more highlights and make the game more exciting to watch. This next table shows the demographic information for each league in 2006. The 2000s were a great year for basketball which is why there are so many reports on the statistics from then. This table will inform you on couple of crucial statistics which many again determine the reason why female sports are suffering. The table that I just presented to you above shows the total amount of game exposure for each league as you can clearly see there is a huge difference between both leagues. The journal that I extracted this from is about injury risk in professional basketball players. Within this journal it talks about the injuries within each league. The journal did say that “women were found to sustain 60% more injuries than did the men.” This cane be argued that as this was 12 years ago the statistic may of changed drastically, but basketball within each league has not changed drastically from my experience of watching both sports. This make the me think that because the women’s basketball being more in a way fragile can make the question if women basketball does not change does it mean that it should be cancelled this of course mainly applies to the US as in the rest of the world especially China women basketball players get paid a more the the WNBA pays it athletes however that could argued is because of China’s corruption within its state allowing people to pay athletes more money. Cancelling the WNBA can make the US economy go down as sponsorships will disappear, contracts will be terminated and venues owned but the teams will be used less which of course results in less money for the venue. In the Global Political Economy by Ravenhill implies that with this new age of technology organisation like the WNBA can shift the scale of economic organisations. On the next page (pp. 258) it give the example economic shocks in one region can affect the world around it and often time have serious local consequences,(Ravenhill, 2017) in appliance to this blog cancelling the WNBA can result in locals spending less and allowing them to keep their money and not allow it to shift around the country making a continuous circle of economic balance. Not allowing women to get the same treatment as their male counterparts is the main reason why the economy is not doing great in the female athlete department, the problem main problem is not the amount of money that a business make but it is the amount of that money being distributed fairly as I mentioned before in the first blog for WNBA players they only get paid 30% of their earnings in comparison to NBA players which get 50% of the money that they make through the year. Women athletes can become and are becoming more popular because of this issue which can increase the economy drastically. It is sad that we are discussing slavery and human trafficking in the 21st century. Although some people are in denial and want to ignore the ugly truth, it is still happening right under our noses.There has been a dark market exposed to simply enslave human beings and exploit them into free labour. It is though they do not consider these people as being sand just brush them off as animals. Let’s be honest, there is more being done about Animal rights than efforts to help those escape this horrible life of enslavement and torture. We witness so much destruction in this world, that we have become unconnected to the pain of others. Close your eyes for a moment and just imagine being taken away from your home, your family and your country to be abused and exploited by people who have no sense of morality. Human trafficking is not something that is often discussed due to its sensitivity and it’s something we do not really think about until it happens close to home. There are Millions of people are being trafficked across the world. According to a research conducted in September 2017, it was estimated that 24.1 million victims are still trapped in modern day slavery,among these, 16 million of them are exploited into labour, 4.8 million are sexually exploited and 4.1 million are forced into state-imposed labour, (Human Rights First, 2017). The economy of Saudi Arabia has been booming for decades ever since their economy blossomed through their ­oil-based industry. That has helped them stay strong and continue to maintain a civil relationship with other leading powerful countries, such as the USA. They have expanded their private sectors, which allows generations upon generations to live in a lavish and rich lifestyles.The country is also known for the many men and women who have been trafficked from many countries across the globe including Bangladesh, India, Sri Lanka, Nepal,Pakistan, the Philippines, Indonesia, Sudan, Somalia, and Ethiopia. These victims are trafficked into for the sole intention of involuntary servitude,force or compulsory labour and sexual exploitation, (Gvnet.com, 2018). They are at the forefront of physical abuse,days of being locked in a room without any food, raped and their passports are confiscated. (Gvnet.com, 2018). Those who are victims of trafficking are mainly exploited due their high vulnerability from living in poverty and they are desperate for any form of work to make money for their families. They are manipulated into believing that they are coming to countries like Saudi Arabia to just earn more money, especially Women who are told that they are going to become housemaids and that they will just be there to help an educated Saudi family,but all is far from the truth instead they have a lifestyle that is inhumane,(Gvnet.com, 2018). Bide Majakoti from Nepal who was manipulated into thinking he was traveling to Qatar for a well-paid job, later to discover that was he was going to be forced into working in the heat for hours without any protection or pay,(FreedomUnited.org, 2017). Qatar is another country that has been highly criticized for their lack of efforts to prevent trafficking into their country.The Human Rights Watch made a report on the amount of human right abuses in Qatar, this included forced labour and the mistreatment of workers. In the beginning of 2013, Qatar was at risk of being ‘a crucible of exploitation and misery’, (McGeehan, 2017). With 2022 world cup approaching, there are concerns on the flow of migrants that will be recruited for this event and the high risk of abuse and horrible work conditions that they will be exposed too. We always hear how beautiful Dubai is, but would your perception of the city change if you were told that they are thriving in a culture where mistreatment of foreign workers is normal? Slavery was only abolished in the United Arab Emirates in 1963 but the culture of slavery still is a lifestyle. Many of these workers are taken over through a sponsorship, which allows them to be controlled by a private sector, and the government does not supervise the employer. This system is known as ‘kafala’, this practice is fundamentally modern day slavery, as it is compulsory labour. At the end of 2017, there was massive uproar on social media when a disturbing video emerged exposing men being sold at auction in Libya, (Quackenbush, 2017). There was confusion and anger across the world for a slight moment and gradually the media and people slowly started forgetting that this problem is still occurring. Even before the video emerged, Libya has been known for the massive amount of war crimes they have committed as they are country still recovering from the fall of Muhammed Gaffadi in 2011, which was the start of a crippled state. Libya is the main portal for migrants and refugees who are trying to escape to Europe from poverty or heavy conflict. Many of these refugees have spent all the money that they own to get smugglers to help them through their journey, but sometimes these journeys result in them being captured and sent to detention centers by the authorities or captured by rebels. According to an article from Aljazeera, it was reported that when detention centers are overcrowded, people are then sold like piece of meat in an open market, (Aljazeera.com, 2017). It is distressing that these immoral and unlawful acts are happening openly and Libya is just an example of what happens in many other countries. Whether we want to acknowledge it or not, it is about time we have dialogues about Modern day slavery and the trafficking of human beings, we must not feel pressured or obligated to keep quiet about social injustice issues that are taking place across the globe. Governments and world leaders should not be silent on these problems and they should also create safeguards and more laws to prevent trafficking and enslavement of people across the world. It is a well-known fact that many countries across the globe have abolished slavery,but we can also question the fact that maybe these laws were implemented to disguise the horrific truth that slavery is still embedded in our cultures and societies. Modern day slavery happens in developed and undeveloped countries, we must acknowledge the powerless and speak out for them. If we don’t speak out for them who will? We must always remember these victims of this horrific crime and whether you believe in God or not, pray for Justice for those who have escaped and freedom for those who are still living this vicious life. Gvnet.com. (2018). Human Trafficking & Modern-day Slavery in Saudi Arabia. Applied Faith. (2015). 2015 Dubai – Slavery is Thriving. What can we do?. Ward, C. (2018). Bishop of London’s Lent Appeal 2019 – Modern Day Slavery. Diocese of London. Available at: https://www.london.anglican.org/articles/bishop-londons-lent-appeal-2019-modern-day-slavery/ [Accessed 14 Dec. 2018]. There is a lot of debates about environmental problems, one of the most popular is about global climate change. It is a major threat to the well-being of humans and other living things like impacts on ecosystem functioning, capital productivity, biodervisity and of course human health. Probably it is one of the most important challenges of our time. Espiecially, climate extremes can have very negative effect on society. Unfortunately, people do not realize the seriousness of the problem and binding international climate change agreements are very difficult to reach. it needs to be seen in context of efforts to keep global temperatures from rising by more than 1.5C (BBC News, 2018). Climate change is having socio-political and also economic effects. The World Employment and Social Outlook 2018 estimated that climate change threatens 1.2 billion jobs. The industries most at risk are agriculture, fisheries, and also forestry. The fact is that, the increase in global warming has created other problems. What is intresting? According to the The Food and Agriculture Organisation (FAO) of the UN, food security is being impacted in a number of African countries and reserachers are studying links between climate change and an increased likelihood of military conflict. Rivers and lakes supply drinking water for people and animals but also they are a vital resource for big industries and for farming. Reffering to the World Wide Fund For Nature, freshwater environments around the world are already under excessive pressure from pollution, damming etc. Climate change only increases this issue and makes this worse. Moreover, extremes of drought and also flooding will become more common, causing a lot of conflicts and displacement. On the other hand we have to answear for one important question; what we should do to save our planet? Scientists think we can do small things to stop the climate change as much. Firstly, we should use less energy and water. Secondly you should turn off lights and TVs instead of switching them to standby also turn off the water when brushing your teeth. You also can help by planting trees. On the other hand it is really important to educate people and give them knowledge about Earth and show problems and how they can help to solve climate problems. Plenty of people do not talk about environmental problems, they do not realize the seriousness of the problem. Talking about climate change does not have to be infused with fear. It is very important to talk about enviromental issues and try to find a solution. People have influence, it means that for example we can reduce current carbon emissions and use nature to draw existing carbon emissions out of our atmosphere. The solutions are available. It sounds stupid because most people will argue that we are living in a globalised world. especially academics they love proving we are in a globalized world. However it seems like more and more countries are now pulling out of trade unions and economic nationalism, has been in the rise. Brexit can be seen as one of the major induction of deglobalisation. However there are much more indications of deglobalisation around the globe and from different continents. It is hard to believe this phenomenon is emerging now because we are still being taught about globalization and that it has been creating a shrinking world. Deglobalisation is the fading of interdependence and integration of nation-state. We have been seeing the fading of relationship between the EU States and Britain. Now just recently Qatar declared that its leaving OPEC and Trump and his protectionism ways. Qatar is the first country from the rich Gulf states to leave OPEC. After more than 50 years in the organisation, Qatar has decided to break up and move on (Aljazeera, 2018). Qatar is not a primary key player in OPEC because they only produce a small amount of oil (Sabga,2018). It is believed that the effect of Qatar leaving won’t be a significant deal for OPEC because Qatar has a little say in the organisation. Qatar has been in dispute with Saudi the leading oil producer in OPEC and that may be the reason why Qatar decided to leave. A fellow senior in the Atlantic Council’s Global Energy Center said that Qatar’s decision to leave is due to having oil policies become more concentrated in the hands of Saudi Arabia and non-OPEC member like Russia (Sabga,2018). There is also talks about Qatar leaving the GCC. The decision to leave the EU is another move to words deglobalization. The European Union is a single market that allows goods and people to move freely it’s basically like one big country. However, the high turnout for Brexit was a shock for many. Those who came to vote for the leave campaign had different reasons on why they wanted to leave. Some voters were against migration laws and free movement of people. The other half wants to have a say made by people in Westminster rather than in Brussel. Another indication of us moving more towards a deglobalised world is Trump. Trump has been all over the place with his tweets and that he wants to make America great. Trump has been imposing tariffs on foreign imports especially on China. The other move by Trump is ending his deal with the Trans-Pacific Partnership (TPP). Just recently Trump has threatened to leave NATO, Trump believes that the other members need to pay more money on defence (REINTS,2018). The examples mentioned, are just briefly touched on. This is just an example and maybe a slight way for us to consider and look for signs of deglobalisation. We are moving towards a deglobalised world this may seem like it is not a big deal, but this move can threaten a countries stability. We are moving towards interdependence and a decline in state-nations. Trade has been declining especially with tariffs that are created by the government and other protectionist measures. Investment lessons, cultural & personal links between countries have been shrink and are even sometimes attacked. Economic nationalism has been gaining support and has been widely spread across nations. Economic nationalism has a specific character they have a self- seeking behaviour just like trump and other right-wing members. With globalisation and the interdependence of states created a somehow peaceful world. However, now countries are starting to pull away from organisations and are using protectionist measures. This may be due to that more and more governments believe in the zero-sum game theory and that the gain of one party necessitates a loss for another party. (O’Brien, Robert,2016) Due to that more and more countries are starting to pull off because they are not gaining as much as other countries within the organisations. Basically, the rise in inequality, loss of jobs in developed countries and unequal distribution of the benefits of globalisation and the growth of populist leaders is making us move towards a deglobalised world. More academic scholars need to look at the new phenomenon of degloblisation. The reason for this is because more countries are closing up their economy and want to preserve their culture. Right wing groups are gaining more votes. protectionist measures and economic nationalism is increasing. Brexit and other deglobliszed acts has took us by surprise and more academics need to studied in depth the future of degloblisation. Qatar’s break-up with OPEC (2018) Available at https://www.aljazeera.com/programmes/countingthecost/2018/12/qatar-break-opec-181208080831667.html. The developing world are still facing the vicious cycle of poverty despite efforts to alleviate world poverty. There have been some steps of success in achieving the United Nations first sustainable development goals of ‘Ending poverty in all of its form everywhere’ as statistically ‘global poverty rates have been cut by more than half since 2000’(United Nations).Impressive! Not so much as despite efforts tackling poverty it still remains to be a global threat as ‘one in ten families in developing regions are living with the families on less than the international poverty level of $1.90 a day’ (United Nations). In addition, the paradigm of poverty has shifted from being a global concern to a geographical concern. There is still so much work to be done but progress is slow. But why? Poverty is an economic condition that constitutes other global issues: hunger and sanitation and health. Therefore, the scope of the issue should be taken seriously as it’s the foremost stakeholder in global political economy, in relation of global consensus of development. The global consensus is to achieve the ‘controversial concept’ of global development through the framework of the Millennium Development Goals (O’Brien. R and Williams. M, 2017). This is a sought after by third world countries as it’s believed it will the end of their economic problems. However, this ideology does not benefit the developing countries as development continues to benefit developed countries. it is believed that in time the trickle down to the developing nations. Though, this has not been the case as overtime the gap between the rich and poor countries have continued to widen. Global poverty has reduced, however in conjunction the distribution of poverty has changed. Poverty is now heavily centralised in regions of Africa and Asia. It is safe to say that poverty has extensively became ‘AFRICANIZED’and ‘SOUTHASIANIZED’ (Ravenhill. J 2017:343). This is mainly because the total share of population living in extreme poverty in Africa and Asia is increasing; with 43 percent in South Asia (2005) a leap from 32 percent in the year 1990 and 28 percent in sub- Saharan Africa in 2005 which previously was 16 percent (1990) (Ravenhill. J 2017:343). Therefore, even though there is a downward trend of poverty in these regions when looking at relevant data, the share of total population living under the poverty line has increased. Hunger is a product of poverty; without poverty hunger wouldn’t not exist. Millions of people die as a result of extreme hunger or malnutrition because parents cannot provide sufficient food for their families. It is a deteriorating concern as the number of people suffering from hunger has risen in the last three years with a total of 821 MILLION people in 2017 suffering (World Health Organisation, 2018). Extreme hunger and malnutrition should not be a 21st century problem; as we produce more food than we consume. Nevertheless, we still have an issue as a third of food produced for the population is wasted every year. We really should be more be more responsible and rational in matters concerning our food: from where it is produced, how we share it and how we consume it (United Nations). By taking a hands-on approach we would be able to sustain environments and generate decent incomes for labourers. This would be an effective step in reducing poverty as respectable income will be generated thus improving the living standards and subsequently hunger. Sanitation and health are an important indicator of poverty. 844 MILLION people still do not have access to basic water service. A basic need is an endless struggle! This has caused the outbreak of cholera causing roughly’ 21,000 to 413,000 deaths worldwide’ (World Health Organisation,2018). Why should it be like this? Imminent death for something that is preventable. We are failing to act effectively! Aid agencies have continued to support the growth of ‘large scaled industries and agribusiness’ despite knowing that the developed countries will gain, in the hope the benefits will trickle down to the poor nation (Calvert. P and Calvert. S, 2007). Thus, ending poverty! Or not. We are still a far cry away from eradicating poverty due to the lack of adequate methods! Poverty kills our population! Surely, we should all be collectively working together to combat these issues to eradicate poverty! So, we can all enjoy the benefit of global development. Is Globalisation as Good as we Think? Nowadays the world is very much a globalised place. People communicate easily with one another, it’s much easier to travel from one part of the world to another, people can by goods from different parts of the world and there is much more movement of people between countries in order to satisfy the countries’ and the people’s needs. This is all good in theory however, how is it possible that it doesn’t have bad implications in a country’s economic growth or economic relations with other countries? The answer is simple, it isn’t. One of the main points of globalisation is having free trade between countries (BBC Bitesize, 2018), which means that countries are able to trade goods without having to pay tariffs. It is supposed to be a good thing, but this means that any company, especially multinational ones, can go to whatever country provides them less expensive ways for them to grow and expand there (BBC Bitesize, 2018). Big businesses usually win this way, since they establish the main price of their products; that brings a problem for smaller businesses as it gets harder for them to compete with those bigger companies. Thus, this also takes away the power of choice from the people since they have to pay the prices practiced by that one main company for a certain product. For example, public transport in London is mainly provided by one company and therefore there is just one main range of prices and not much competition or way of people to have the choice for what suits their needs better. The big multinationals that establish themselves, usually in developing countries, do so because it is cheaper to operate there yet it can cause a good deal of damage both to the country in which they established themselves in and to their own country. Firstly, the companies use that country’s resources to their own profit, however, the profits usually go to the main country and not the country where the company has its factory (BBC Bitesize, 2018). Even though the citizens will have jobs, it will be jobs with low wages that are not even compared to the wages that the company would have to provide in a developed country and there is little or none regulations (Heywood, 2014). This can be seen as a form of neo-colonialism since the developed countries use many of the resources developing countries have (Heywood, 2014) and that prevents the country from growing. Furthermore, having such companies operating in less developed countries might lead them to close down local business. Usually when multinationals like this find another place that provides them better opportunities to grow, they just close down their factory and move to where it is cheaper, leaving lots of people without a job (BBC Bitesize, 2018). On the other hand, we have the main country that loses, since these countries seek less expensive ways to operate in other countries, there is a loss of jobs in the main country and even a loss of smaller business since they won’t be able to compete with the prices (The Balance, 2018). Another big problem globalisation brings is that it also damages the environment. The expansion of global capitalism can provoke global warming, which can instigate the destruction of several parts of the planet if not the whole planet (Ritzer,2010). The expansion of the big multinationals can cause huge damage to the environment, since they operate in less developed countries. Usually in these countries the laws on pollution are not as strict as they would be in the main country, which, even though it helps the multinational to save money, it damages the environment due to the big industrialisation and emissions from the host countries (Development & globalisation, 2018). Furthermore, these developing countries are becoming pollution heavens, since they hold much of the global industrialisation, while others can enjoy the products without having to suffer from the same consequences (O’Brien and Williams, 2013). The main problem with these environmental issues is that they might not be reversible and this can come to the extent of causing the destruction of the human kind. Offshore outsourcing is another issue that comes along with globalisation. Outsourcing is a very complex phenomenon in which companies hire other companies or individuals to do certain tasks that the companies were supposed to do by themselves. Offshore outsourcing is mainly the same thing, however, instead of getting companies or individuals from their own country, the get them from other countries. This can cause several problems like job loss in the country doing the outsourcing, since they are getting people from other countries to do the work people from their own country could be doing (Ritzer, 2010). An example of this is the Indian companies that are doing outsourced work as call-centre for Japanese firms. Furthermore, too much offshore outsourcing is seen as destructive, for example, in the US, offshore outsourcing is seen as responsible for the destruction of many businesses and industries. Then there is the globalisation of the economy. Economies nowadays are all interconnected which causes a problem that appears in one country to spread to another one (Ritzer, 2010). A really good example of this is the 2007 crisis that started in the United States (Heywood, 2014) and spread throughout a number of countries that had economic ties with the US. If the economy wasn’t as globalised as it was, maybe the crisis wouldn’t have spread as much as it did. Even though globalisation has many good aspects, should we keep it going? There are many problems that come with globalisation and if globalisation keeps happening and expanding they won’t be solved and will probably only get worse. Since it is such a complex term, I don’t believe it is possible to stop it, however, we maybe able to slow it down and to focus more on the issues that it brought in order to solve them. BBC Bitesize. (2018). GCSE Geography – Globalisation. Available at: https://www.bbc.com/bitesize/guides/zxpn2p3/revision/1 [Accessed 10 Dec. 2018]. Heywood, A. (2014). Global politics. 2nd ed. Palgrave Macmillan, pp.101-114. OPERATIONS management. (2018). Impact of globalisation. Available at: https://emmahurstbusiness.weebly.com/impact-of-globalisation.html [Accessed 14 Dec. 2018]. The Balance. (2018). Is Globalization Good or Bad for Developed Countries? Available at: https://www.thebalance.com/globalization-good-or-bad-for-developed-countries-4011193 [Accessed 12 Dec. 2018]. O’Brien, R. and Williams, M. (2013). 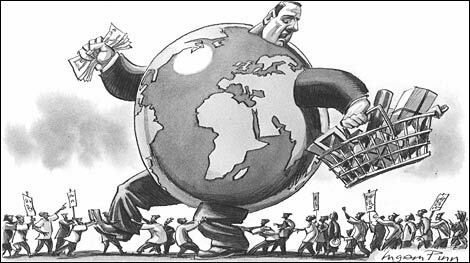 Global political economy. 4th ed. Palgrave Macmillan,pp.256-257. Development & globalisation. (2018). Positives & Negatives. Available at: http://developmentandglobalisation.weebly.com/positives–negatives.html [Accessed 12 Dec. 2018].